I’m back with another Friday Frugal finds post. 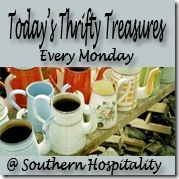 Here is what I found at thrift stores and yard sale this week. I stopped in my Value Village store and found this old Playskool toy bench for $2.02 I love the old, wood, classic kids toys and this will be fun for my nephew to play with. I also picked up a vintage milk bottle for $1.01 and a short sleeve sweater/jacket to wear over dresses for $2.49 (not pictured). Then it was yard sale time again on Saturday. I found this HUGE vintage Pyrex milkglass mixing bowl for $3.00. Steal of a deal as it would be $15-20+ at antique stores. And these little wood boxes for 25¢ each. Not sure what I will use them for but for 25¢ I couldn’t pass them up. I am thinking spice packets, oatmeal packets in my pantry maybe? And then of course you have already seen my $2.00 yard sale mirror. I couldn’t believe she only wanted $2 for this mirror – I snatched it right up! I know it is hideous looking, but nothing that a quick coat of spray paint can’t fix! I even shocked myself by already having this mirror painted and in place before I eve showed it you on a frugal finds post. Yay for getting things done! Here’s the how to post on how to spray paint a mirror frame or even a picture frame that you find at a yard sale or thrift store. Loving the after much better! Did you find anything good this week? You found some good stuff this week. Love the mirror and what a good idea of how to use the little wooden crates! I have a milk bottle in that shape and last winter I covered it with a sleeve from an old sweater that I had and filled it with branches from my back yard then hung some snowflakes from the branches. It was one of my favorite winter decorations. We went to Florida for the holiday weekend. There were tons of yard sales there but because we had driven through the night and my Hubby and I were majorly sleep deprived we didn’t stop at any. We did go to the local Goodwill but didn’t find anything.